Daily Illuminator: Dragons Have Invaded Warehouse 23! January 18, 2017: Dragons Have Invaded Warehouse 23! As a professional dragon-slayer, (you are, right?) 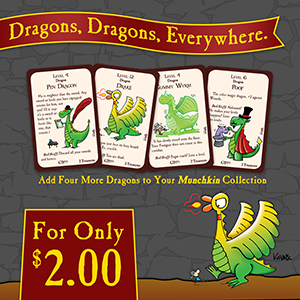 you probably know about Munchkin Dragons and Munchkin Dragon's Trike. Well, you may think you have tackled all the scaly beasts that Munchkin has to offer, but you're wrong. There's one more horde left to battle, and it's available now on Warehouse 23! Get this dragon's horde, and its accomplices, on Warehouse 23 now, before they fly back to their keep!